It's been a while since my last blog post, but Today I'd like to talk about GR8Conf US 2017. This was my second time attending GR8Conf US and it was very special because I had the opportunity to give my first talk in a conference! Before going into the details of the 2017 edition, I want to share a little bit more of why this is very important for me. When I started to work with Groovy/Grails in 2010 I was totally new to software development using JVM related techonologies and I found the Groovy community a very friendly one. A year later I started enjoy Grails so much that I became some sort of advocate for it and started to follow people working heavily on Grails like Graeme Rocher, Jeff Brown, Ted Naleid, Burt Beckwith, Bobby Warner, Ryan Vanderwerf, Dhiraj Dmahapatro, Colin Harrington and others. Few months/years later I started to see Minneapolis as a great place to work with Groovy, companies like Target, Object Partners and Refactr had a lot of employees contributing to the community on a daily basis. I wanted to travel to Minneapolis for GR8Conf and meet all these cool people, unfortunately, I didn't have the money to pay for my travel expenses. I finally decided that I wanted a job in Minneapolis but I couldn't land one since my show stopper was the need for a work Visa. During that time I met great people that gave me advices for my career and that helped me to land a job in Los Angeles, California... I'd like to thanks Craig Burke and Dan Woods for answering personal questions during that time. A few more years later, I finally had the opportunity to attend GR8Conf US last year and had a wonderful time! After that I knew I wanted to live in Minneapolis and one day speak at the conference, a couple of months later I signed a job offer with Target and here I am... enjoying everyday, working in cool things with very talented people. So one of my career goals was always to speak at GR8Conf, I can check it as done! Going back to GR8Conf, I'd like to share some interesting talks that I attended to, hopefully the videos will be online soon! In the morning I went to the “Amazon Alexa Workshop” workshop by Ryan Vanderwerf and Lee Fox. This session covered all the fundamentals to write AWS Lambad with Groovy and create your first Alexa skill. It was very fun to use Groovy for something like this, if you are looking for things to do on your spare time check it out! Accelerating developer productivity with Gradle: I'm a big fan of Gradle and Nebula plugins so I really wanted to attend this talk. Craig did a fantastic job on showing the new features on Gradle including the Build Cache and Composite Builds. In my case, composite builds is something I'm exploring for shared libraries... I know I shouldn't write shared libraries in a microservice world but what about those for common things like network protocols? You should give it a try, I will. Devos @Scale: Never had a chance to attend Baruch's talks and it was phenomenal, He has a unique way to walk you through multiple scenarios inside a software organization... great talk. Decoupling your microservices Ted Naleid talked about how to deocuple your microservices using technologies like Apache Kafka and Netflix Hollow. I was looking forward to this talk since these are two techonologies that I've been using the last few months and I find them very powerful in a microservice world, specifically Hollow... Netflix Hollow is a java library and toolset for disseminating in-memory datasets from a single producer to many consumers for high performance read-only access (http://hollow.how/). I watched previous talks from Ted and I know how important is performance and details for him, this was a great talk, hopefully it opened the mind for the others in the room to start exploring this. After that we headed to the Object Partners Meet & Greet where I had the opportunity to talk with very nice guys doing some cool stuff. It was great to catch up with people that I already knew and made new friends. Of course we had the Groovy Puzzles hosted by Baruch (@jbaruch) and his especial guest Daniel Woods (@danveloper). As you can imagine they had great groovy puzzles and drinking rules. At the end, Dan and Baruch finished a bottle of bulleit rye drinking shots. Dan also gave a few copies of this book "Learning Ratpack", if you don't have this book I encourage you to buy it. Not only because of the great quality of the book, but also because all the royalties will be donated to the GR8Ladies. Infrastructure as Code: This talk by John Engelman covered HashiCorp's Terraform to manage infrastructure and applying build, test, commit cyclle and CI to infrastructure projects. John has a lot of experience on this topic, I really enjoyed his talk. Continuous Deployment to Kubernetes with Spinnaker: Lars Wander explained how to setup pipelines that demonstrate best-practice deployments to production of Docker containers using Kubernetes and Spinnaker, including picking deployment strategies, rollback mechanisms and more. Ratpack Web Framework: This talk by Dan Woods was awesome, he did live coding without slides! He did some nice demos of how modern web development in Groovy should be using Ratpack. If you don't know, Ratpack is a set of Java libraries for building modern HTTP applications. It provides just enough for writing practical, high performance, apps. It is built on Java 8, Netty and reactive principles. Real Time Traffic Visualization with Vizceral and Hystrix: I had to attend this one because I was the speaker, right? This was the best talk in the conference hehe well probably not but I really enjoyed showing how Hystrix works and how to collect metrics in order to visualize traffic. You can find my slides here and my code on Github. Hopefully the video will go online soon. Groovy for systems administrators: In this live coding talk Dan explained how we can do system administrator tasks using Gradle, Nebula OS package and other great tools, obviously using Groovy. To close this awesome conference, Paul King gave the talk "Groovy Update: What's new in Groovy 2.5+". He talked about new upcoming features in Groovy, very exciting stuff... really looking forward to the parrot. After that we headed to The Local to have some appetizers and drinks. I really enjoyed this networking event. I would like to thank Doug Sabers and the GR8Conf US organizers for such a wonderful job! Overall GR8Conf US 2017 was a fantastic conference, and I’m already looking forward to attending Gr8Conf 2018! I had a great time. I think everyone knows that the Groovy community is full of talented people, they are great human beings, kind and friendly... Software is a passion that drives everyone but there is more than that and I'm looking forward to contribute back to it and see them again soon. When you use Grails for a new project, the default DBMS (DataBase Management System) is H2. A cool characteristic of this DBMS is its capability to handle in-memory tables: it is possible to create a database living in the RAM memory. One nice feature of IntelliJ is the Database Tool Window. 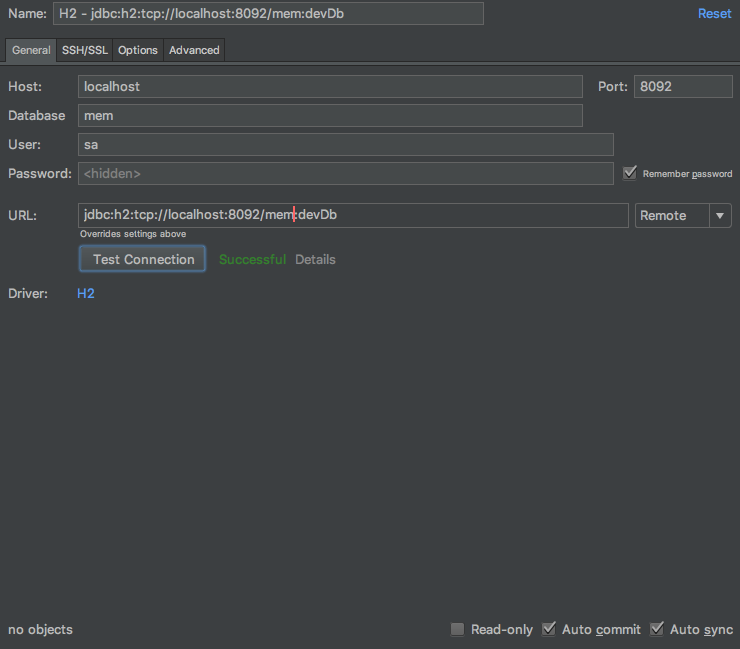 Wouldn't be nice to connect to your H2 in memory database using IntelliJ? Well that's possible using a TCP Server for client/server connections. IMPORTANT: This is an example for development/test environment, you should modify this behavior for production environment. This was my first time attending GR8Conf and had a wonderful time and definitely it was a great experience. As I mentioned to a few guys, I always wanted to attend but the circumstances were not appropriate on previous years but finally I did it! In the morning I went to the “Getting Started With Grails 3” workshop by Jeff Scott Brown. This session covered all the fundamentals of the framework, probably better as an introduction to developers not familiar with the framework but Jeff also included tips and tricks for developers with experience. In the afternoon I attended Jeff Brown’s “REST With Grails 3” workshop. He explained Grails capabilities to build RESTful services with a small amount of code, explained the content negotation and more. The best part was his introduction to JSON views (more to come). Graeme Rocher kicked off the first day of talks with a keynote detailing the current state of Grails and the future, which is very exciting! He talked about all the new cool features in Grails 3.2: GORM 6 Suite which includes RxGORM, AngularJS 1.0 Scaffolding and JSON Views 1.1. I can't describe how excited I was when I saw all these cool features, Grails is a solid framework and evolving very fast thanks to the hard work of the OCI team and the community. Gradle Recipes for Android: I don't have background in Android but a few months ago I had to work on build scripts for an Android app. This talk by Ken Kousen (kenkousen) was very helpful to me in order to understand more about the Android ecosystem and how it plays with Gradle. I can certainly tell that I learned a few tricks that will improve our current setup. Asset-Pipeline: This talk went over how to make the best use of your static assets. If you don't use asset-pipeline, you should start doing it now. This talk was important to me because in the company I work for we have several issues with the use of static assets. This was a great opportunity for me to talk with David Estes (@davydotcom) and ask him some questions. Thanks again David. Codenarc Revisited: Jenn Strater (codeJENNerator) talked about the importance of using codenarc for code quality. If you don't know it, Codenarc is a static analysis tool for Groovy that enforces style, detects bad practices, and suggests improvements. After that we headed to the Object Partners Meet & Greet where I had the opportunity to talk with very nice guys doing some cool stuff. It's funny because I live in Los Angeles and I never had the chance to meet Joshua Tuberville from VirtualTourist, cool guy. Of course we had the Groovy Puzzles hosted by Baruch (@jbaruch) and his especial guest Daniel Woods (@danveloper). As you can imagine they had great groovy puzzles and drinking rules. At the end, Daniel gave away two copies of his book "Learning Ratpack". If you don't have this book I encourage you to buy it. Not only because of the great quality of the book, but also because all the royalties will be donated to the GR8Ladies. Ratpack Web Framework: This talk by Daniel Woods (@danveloper) was great! He did some nice demos of how modern web development in Groovy should be using Ratpack. If you don't know, Ratpack is a set of Java libraries for building modern HTTP applications. It provides just enough for writing practical, high performance, apps. It is built on Java 8, Netty and reactive principles. AngularJS in Grails: Craig Burke (@craigburke1) talked about building an AngularJS app using the Grails Angular profile. I really wanted to attend his talk and learn more on how to use AngularJS with Grails. I really liked his Client Dependencies Gradle Plugin that allows you to declare client side dependencies in build.gradle from bower or npm without installing them. Spring Cloud into Production: Todd Miller did a good explanation step by step on how to take a microservice architecture to production on AWS using technologies such as Spring Cloud Config, Eureka, Ribbon, Hystrix, Turbine. If you ever asked yourself how to take a microservice architecture from development to the cloud this is the right talk for you. Fun With Spring Security: In this talk, Burt explained some use case scenarios for spring security: auto-role, lockout, no roles, x509 and extend the AuthenticationProvider to use an "organization". I'm a big fan of Spring Security, actually my wife always tell me that I'm obsessed with it. As many technologies it has pros and cons, I really love it and I looking forward to contribute to it. To close this awesome conference, John Engelman (@johnrengelman) gave the talk "Writing Software in the Age of Agile: Microservices, Cloud, Containers, & DevOps". He talked about new technologies and ideas that help to refine that it means to develop software in an agile environment and making a lot of emphasis in doing things faster with high quality. It was a great talk, specially if you care about the whole SDLC and the quality of your work on a daily basis. After that we headed to Gr8Ladies & Gr8Allies Networking Meetup to have some appetizers and drinks. I really enjoyed this networking event. I would like to thank the GR8Conf US organizers for such a wonderful job! Overall GR8Conf US 2016 was a fantastic conference, and I’m already looking forward to attending Gr8Conf 2017! Also, special thanks to Jenn Strater (@codeJENNerator) for all your help and support before and during the conference, I really appreciate it! Congrats again on your next adventure in Denmark and looking forward to meet again. As we know, Grails services by default have automatic transaction management such as propagation and so on. By setting transactional to false you disable automatic Spring managed transaction demarcation for every method in the service. When is set to the true, The propagation level of the transaction is by default PROPAGATION_REQUIRED. Also we can use the @ Transactional and @ NotTransactional annotations. Configure the Datasource.groovy file to use a MySQL connnection. Now, if we invoke the save method, we can see the following in our database log. As you can see, is setting the autocommit to 0, inserting, commit, set autocommit 1. This is what we are expecting to do, this is the way we handle transactions. By default, the Grails transactions have REQUIRED propagation, and in this case the 'anotherSave' method will join the current transaction. At first glance we can see the change in autocommit but the most important thing are the numbers (10 and 11). These numbers represent the thread id, with this we know that they are running in another transaction. Ok, we know we have two transactions, let's make query to the database. As you can see, we have a new record in our database, this was generated by the method anotherSave. This is because we are running this statement in another transaction. IMPORTANT: automatic rollback occurs if a method throws a runtime exception (i.e. one that extends RuntimeException) or an Error. Checked exceptions do not roll back transactions. Ok, by now you know that the transaction disables autocommit to execute one or more statements and then do the commit. Look at this... is under the same thread. So this option is discarded. So this is not working as we expected... oh but maybe "we can just change the connection to autocommit". Oh! is changing the autocommit but wait... is the same thread. What is happening with the first query. Of course this seems to be ok because we are inserting everything and the code is not throwing a RuntimeException or Error. Lets add a RuntimeException and run it again. For this, we will truncate our table. Yes we set the autocommit to true but we were under the same transaction so our first query was commited too and we don't want this. This is where we can use another propagation. Let's try it with NOTSUPPORTED and use GORM again. NOTSUPPORTED execute non-transactionally, suspend the current transaction if one exists. Let's try this piece of code. We will truncate our table before that. We only have the record that we want and because we had an exception, the transaction in the save method became a rollback. This is a nice approach. PROPAGATION_MANDATORY: Support a current transaction; throw an exception if no current transaction exists. PROPAGATIONNESTED: Execute within a nested transaction if a current transaction exists, behave like PROPAGATIONREQUIRED else. PROPAGATION_NEVER: Do not support a current transaction; throw an exception if a current transaction exists. PROPAGATIONNOTSUPPORTED: Do not support a current transaction; rather always execute non-transactionally. PROPAGATION_REQUIRED: Support a current transaction; create a new one if none exists. PROPAGATIONREQUIRESNEW: Create a new transaction, suspending the current transaction if one exists. PROPAGATION_SUPPORTS: Support a current transaction; execute non-transactionally if none exists. These examples were developed along with Raj Govindarajan. Hope this can help you in the future. A few months ago I was asked to create a login with ReCaptcha using spring security core and recaptcha plugins. At that time I made a plugin for solving the requirement Spring Security Plugin Recaptcha. Today I want to share another idea to accomplish this. Assuming the application has ReCaptcha and spring security core the first thing to do is add the ReCaptcha widget our loginview, usually auth.gsp. Then generate a filter (AuthFilter.groovy) to override the 'authenticationProcessingFilter' bean (this filter subclasses the plugin's RequestHolderAuthenticationFilter to Maintain its functionality). You can name this filter as you like and put it under /src/groovy folder. Once done, we can use our ReCaptcha widget as part of our authentication process. Older posts are available in the archive.